It is no longer that news that more than fifty percent (50%) of Nigerians applying for visas to India are applying for medical purposes.This article has been put together to serve as an easy to follow guide to any Nigerian who needs to travel to India for medical reasons. For anyone who wants to go to India for medical reasons, he or she is not expected to travel alone. The patient is expected to be accompanied by a relative who will assist the patient when in India. The cost of Indian medical visa is Two hundred and fifty two US dollars ($252) only. The good thing about applying for medical visa to India is that, you will not be asked to pay the visa fee if your application is likely to be denied. This fee is paid directly to the Indian High commission. NOTE: Before proceeding to apply for medical visa to India, it is important to have completed all due process with the hospital you intend to visit for whatever procedure you are travelling for. That is, get your local medical report accessed by the Indian doctor and get all other supporting documents (will be discussed later in this article) for visa from the Indian hospital/doctor. 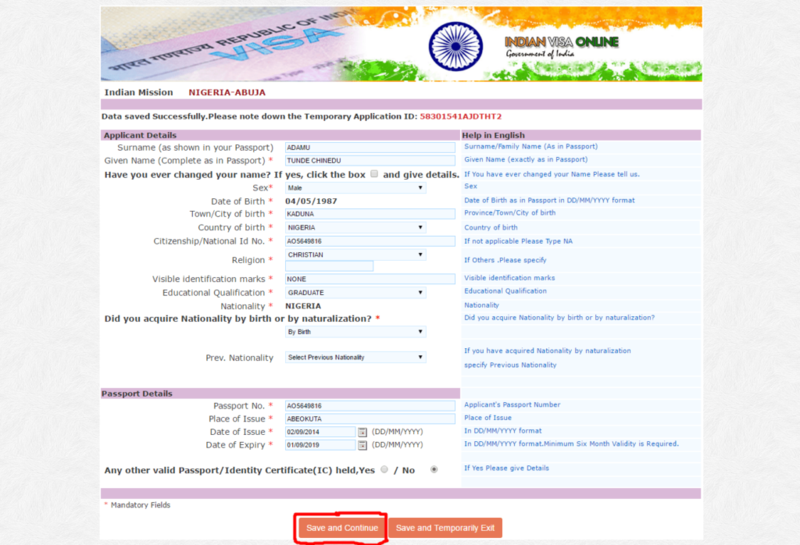 To apply for medical visa to India, you need to complete a visa application form. This application form can either be completed online at the Indian embassy website or collected at no cost at the Indian high commission at Lagos or Abuja. It is advisable to always use the online method. STEP 1. 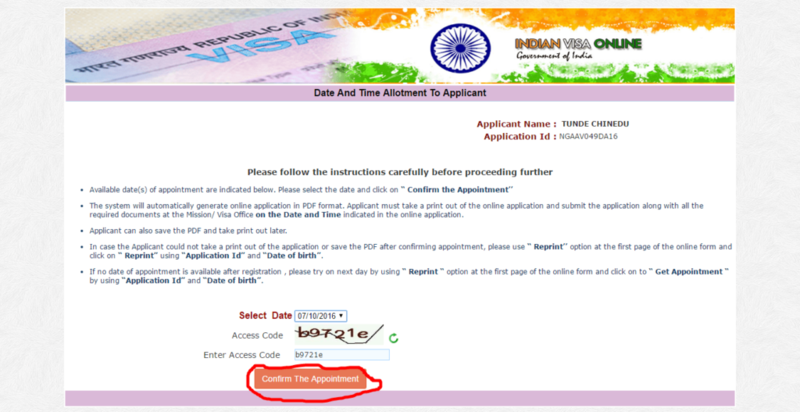 Once you are on the website (Click here to go to the Online portal), you are to select “Regular Visa application” as shown the image below. This will then automatically open a new tab on your system. STEP 2. In the new tab, you will be brought to an online visa application page, which will request you to complete some questions. These questions include country you are applying for Visa from: click Nigeria from the options provided, if you are in Nigeria. Indian Mission: if you are in Nigeria, it can either be Abuja or Lagos. So click whichever of the embassy is closest to you from the drop down menu. Nationality: ‘Nigerian’ should be chosen from the options in drop down menu in this column if you are a Nigerian. Date of Birth: simply enter the day, month and year you were born. Expected date of Travel: this may not be accurate, but it should be close to the actual date a patient will eventually travel. 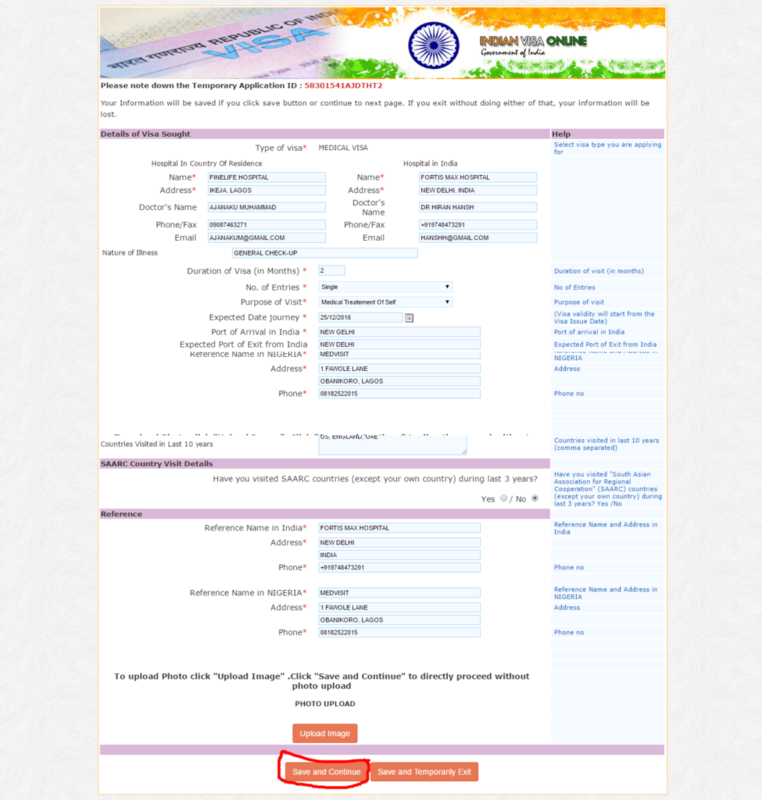 Visa type: click on the dropdown arrow in this column and a list of options will be provided. The patient is expected to click Medical visa, while the attendant will click Medical attendant from the options. Access code: this is just to ascertain that you are not a robot. So you are to re-enter the access code in the space provided below. Note that every questions with red asterisk (*) are important and must be answered. These steps are illustrated in the image below. After completing this stage, you then click continue. Applicant’s details: which all must be filled as it appears on passport. Passport details; passport number, place and date of issue, expiry date etc, must be filled correctly. If applicant possesses any other valid passport or Identification certificates will be asked, if YES, enter information required, if not, just click ‘NO’ and continue. STEP 4. Moving to the next page on the form, Applicant’s address details Family details and Profession/Occupation details are required. As seen in the image above, details of applicant’s present and permanent address are required. If they both have same address, just click the box that says “Click Here For Same Address”, it will automatically fill up. Also Father and Mother’s details are required in the Family details. And if Applicant is married, details of spouse are also required. All aspects of this page are important, so applicant is expected to complete as required. STEP 5. 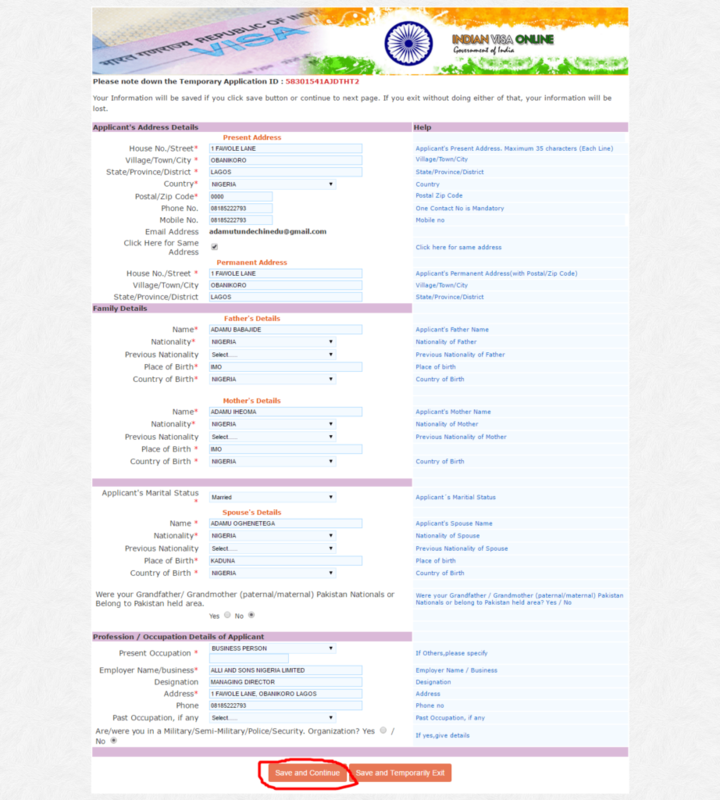 In this page you will be required to fill information like details of visa sought, SAARC Country visit details, Reference and photo upload. Each tab is explained below. Details of Visa sought: This include details of Hospital and doctor in your home country (Nigeria) and that of the hospital in India. Details of the hospital and Doctor in India can be derived from the quotation and invitation sent by the hospital through your medical tourism agency. Nature of illness: This can also be found in your invitation. SAARC Countries visit details: If you have visited any South Asian Association for Regional Cooperation country in the last 3 years, simply give details, If not click ‘No’. Reference: Name, Address and Phone number of the Indian hospital will be given for Indian reference, while Medvisit address and phone number will be given for Nigerian reference. After entering the details, you will be required to upload your passport photograph. In a situation where the passport photograph isn’t available, just go ahead and click save and continue. See illustration in the image below. STEP 6. Now all information entered from the beginning of the form will be brought in this page for you to view and edit where necessary. If any mistake is found, click ‘Modify/Edit’ if not; click ‘Verified and Continue’. STEP 7. On completing the form, it will lead you to a page to pick a date for the interview among the available dates and confirm the appointment. After this is done the form will automatically download on your system as a PDF file. You are then expected to print out this form, attach a 2” by 2” passport photograph with your name and signature behind it and prepare for your interview. 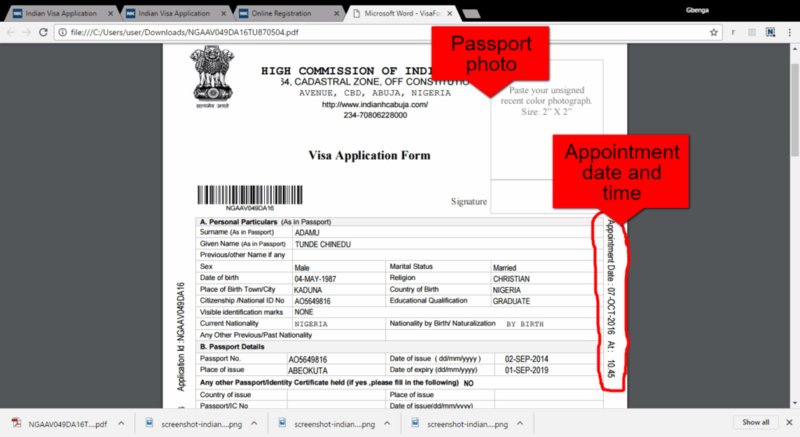 An example of what the printout will look like with where to affix your passport and the visa appointment date is shown below. If you have gotten a date later than your expected date of travel (as indicated by the hospital) as a result unavailability of an earlier date, simply place a call to Medvisit office for assistance in rescheduling.Visa interview must be attended in person and applicants (patient and medical assistant) are expected to arrive early enough as the working hours for visa interviews at the Indian high commission is only from 9am to 11am. Remember, applicants are expected to appear with all original and photocopy of documents including the International passport. Ensure that you equip yourself with information like the name of the hospital to receive treatment, city where it is located, expected duration of stay in India and more as the interviewer will want to confirm if the documents correspond with what he or she is hearing from the applicant. If all questions have been answered correctly and the interviewer is satisfied, then you will be asked to return after a few days for your medical visa. In conclusion, application for Indian medical visa is quite easy and you also enjoy the opportunity of returning back at a given date if the interviewer requests for more documents that are not present as at the time of the interview. Medvisit is Nigeria’s Leading Medical tourism Agency that helps patients get quality healthcare in hospitals in India. If you need help in applying for medical visa to India, call us on 08182522015 or send a mail to care@medvisit.com.ng. Medvisit Cares.